Why St Margaret’s School for Girls? As an all-through school, St Margaret’s is able to ensure an easy transition and progression from the junior department to the senior department. However, new girls entering at the first year of the senior department find that the process for them is also smooth. This is facilitated by an induction day during the third term of 7 Junior: new entrants meet with key members of staff and establish friendships with girls already in the school so that they feel part of the whole school community by the time they begin their secondary school career. To find out more about St Margaret’s, please visit the news page for updates and information about the school; alternatively, for more information about our admissions process, please contact us. The academic programme followed in I and II Senior provides breadth, balance and enjoyment in a wide range of subjects and gives the girls a firm basis on which to build further study for SQA examinations. In III Senior, girls select eight subjects for study at National 5 level from a wide range of choices. In V and VI Senior, subjects may be studied in greater depth at Higher and Advanced Higher, and we offer a number of subjects that can be taken in the final years at school without prior knowledge. Our seniors are encouraged to work hard whilst enjoying everything else that life has to offer at St Margaret's; indeed, girls are motivated to participate in many and varied extra-curricular activities, events and trips which allow them to develop confidence and self-esteem as well as to make friendships across year groups. Above all girls reap the benefits of being known and supported as individuals within a close-knit, yet outward-looking school community, where aspirations are high and values upheld. 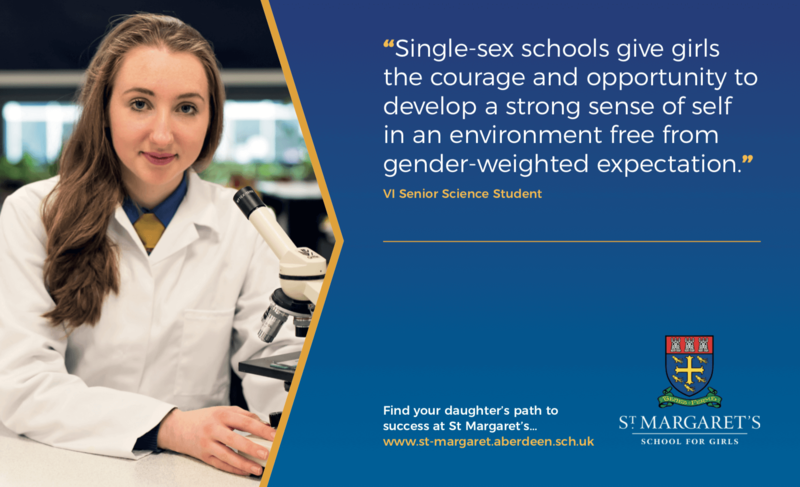 At St Margaret’s we are proud of our outstanding academic achievements; but we are equally proud of our reputation for producing socially aware, independent and confident young women. Our school is set in the heart of Aberdeen city, in the north east of Scotland. How are senior pupils guided through the UCAS process? Why choose St Margaret's for senior school?